What is Very Early Warning Smoke Detection? VESDA by Xtralis very early warning aspirating smoke detection solutions with continuous air sampling provide the earliest possible warning of an impending fire hazard. VESDA aspirating smoke detectors buy the critical time needed to investigate an alarm and initiate an appropriate response to prevent injury, property damage or business disruption. 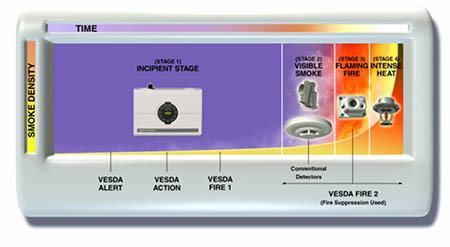 VESDA detectors have multi-level warnings and a wide range of sensitivity that does not degrade or change over time, so even minute levels of smoke can be detected before a fire has time to escalate. In addition, VESDA systems are manufactured using targeted Six Sigma techniques and ISO 9000 standards and have been certified by regulatory bodies worldwide.